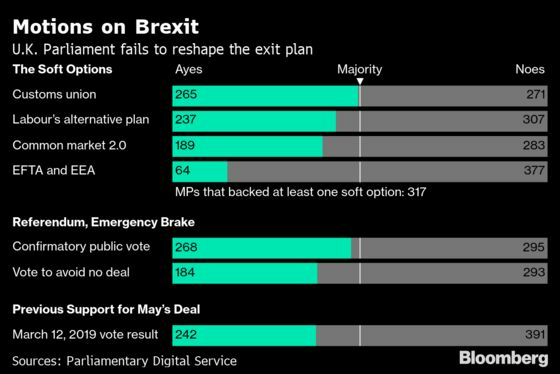 The U.K. Parliament will have another try at finding the Brexit consensus that’s eluded the country for more than two years. If lawmakers succeed, they will present Prime Minister Theresa May with an impossible choice: Break her electoral pledges and split her party, or hold an election that no one wants. Last week Parliament got within six votes of backing the lowest-common-denominator of a soft Brexit: staying in the European Union’s trading bloc, known as the customs union. That’s the option most likely to succeed today. But while it might command a majority in the House of Commons, there’s nothing like a majority for it in the Conservative party. So with a recent poll showing the Labour Party ahead, May will face the choice between what would be the biggest U-turn yet and calling an election. Conservative Party Deputy Chairman James Cleverly added to the speculation that an election could be imminent on Sunday, saying the Tories are taking “pragmatic” steps to prepare for one. The prime minister’s team hinted last week that she hasn’t given her deal up for dead yet. So prepare for a fourth attempt to push the unpopular accord through Parliament. May could throw her own dilemma back at lawmakers in an attempt to get it over the line. The alternatives are the soft Brexit that Parliament wants or an election with a terrible campaigner at the helm that could put dozens of Tory MPs' jobs at risk. Once again, May seems to be hoping her weakness will be her strength. The pound is untradable, says Bloomberg Opinion’s Marcus Ashworth. 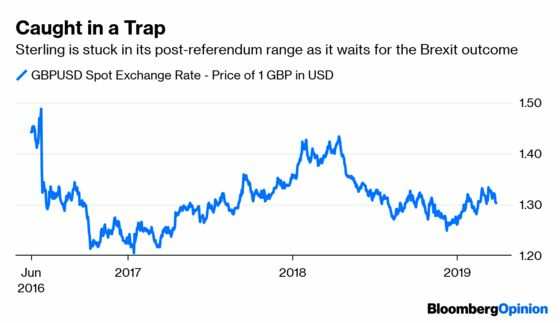 Sterling has barely budged in the past 12 months, caught in the “tractor beam” of the intransigence, hopes and fears surrounding Brexit. Merkel’s Move | As part of its no-deal preparations, the bloc needs to make a plan to protect the now-open Irish border. Germany is particularly concerned that Ireland hasn’t done enough to get ready, and Chancellor Angela Merkel will demand a plan when she meets Irish Prime Minister Leo Varadkar in Dublin on Thursday. One Nation | Pro-Europe Conservatives have formed a new grouping in an attempt to counter the influence of the Brexiteer wing in the party, as it gears up for a leadership election to replace May. As many as 50 parliamentarians are signed up to the so-called One Nation group, according to Nicky Morgan, a former minister. “We are at our most effective when we are a broad party championing one-nation politics,” including an internationalist outlook, social liberalism and running a sound economy, she said. Flat White Economy | The digital economy has become the U.K.’s largest economic sector, accounting for 14.4 percent of gross value added last year and almost half of its growth, according to the Centre for Economics and Business Research. But the so-called flat white economy, which includes media, film and advertising, faces challenges in finding sufficient skilled labor after Brexit, the CEBR says. Blame Game | Julian Smith, the chief whip whose job it is to get May's unloved deal through parliament, told the BBC the government should have been clearer after losing its majority in the 2017 election that the consequence was a softer Brexit. Unusual stuff from the man in charge of party discipline. On the Markets | The pound edged higher to $1.3041. Goldman Sachs reckons a long delay is now more likely, and with that, a 40 percent chance that Brexit will be reversed in the end. “The longer that extension, in our view, the greater the likelihood of no Brexit at all,” the bank said. It puts the risk of no-deal at 15 percent. Want to keep up with Brexit? You can follow us @Brexit on Twitter and join our Facebook group, Brexit Decoded.